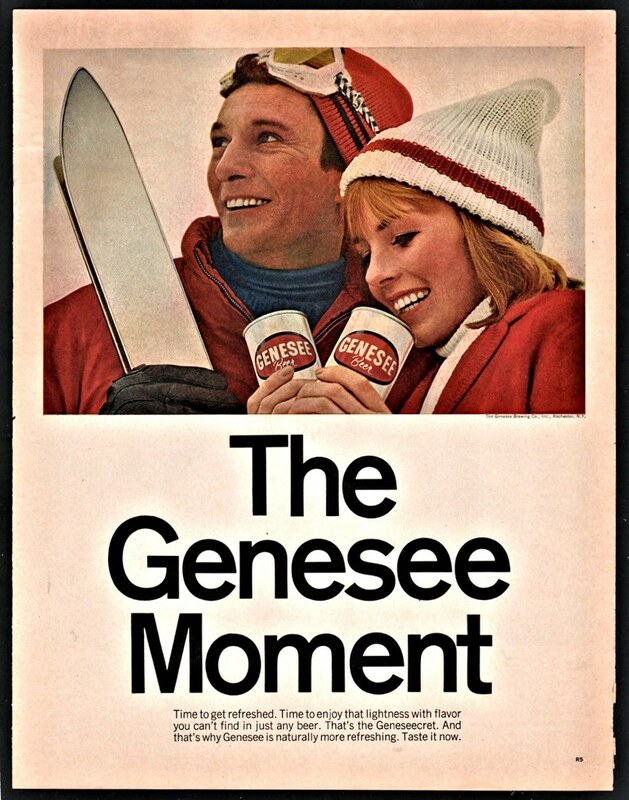 Thursday’s ad is for Genesee Beer, which was founded in Rochester, New York, originally along the Genesee River, but in 1878 they moved up into Rochester proper. Their Genesee Cream Ale, in the simple green can, was one of our go-to beers when I was in high school. Since 2009, the brewery has been part of North American Breweries. This ad, from 1966, features a couple skiing, and who both look cold. He’s looking off in the distance, but she’s eyeing the two cans of Genesee she’s holding in her hands. I think it’s possible he’s not getting any beer. Today is the 35th birthday of Kushal Hall, former Director of Brewing Operations for Speakeasy Ales & Lagers. 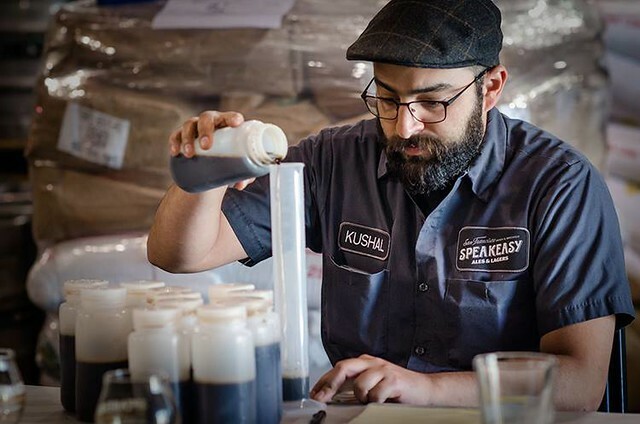 Kushal had been brewing at Speakeasy since 2007, but left in May of 2017 to open his own space in Southern California. 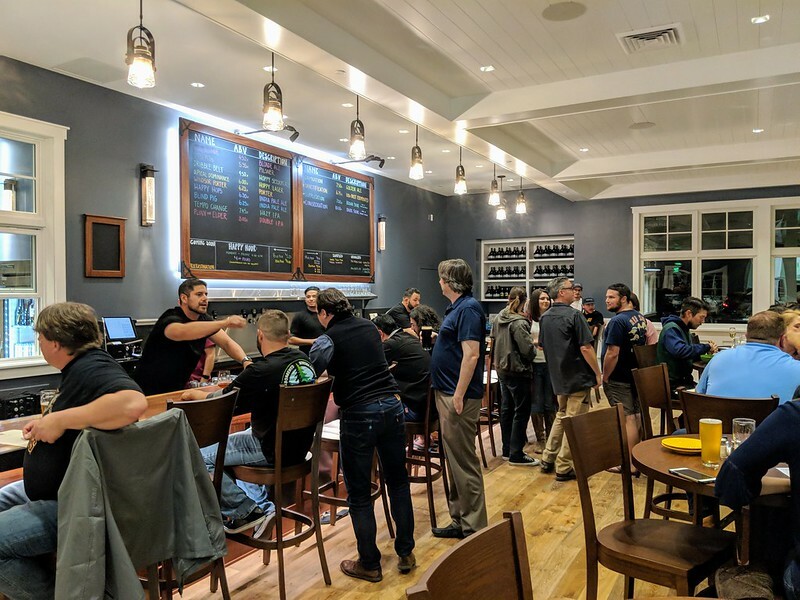 The new brewery is called Common Space Brewing and is located in Hawthorne. While Kushal studied photography at UC Santa Cruz, I think we can all agree the world is a better place since he became a brewer. A terrific brewer and person, please join me in wishing Kushal a very happy birthday. 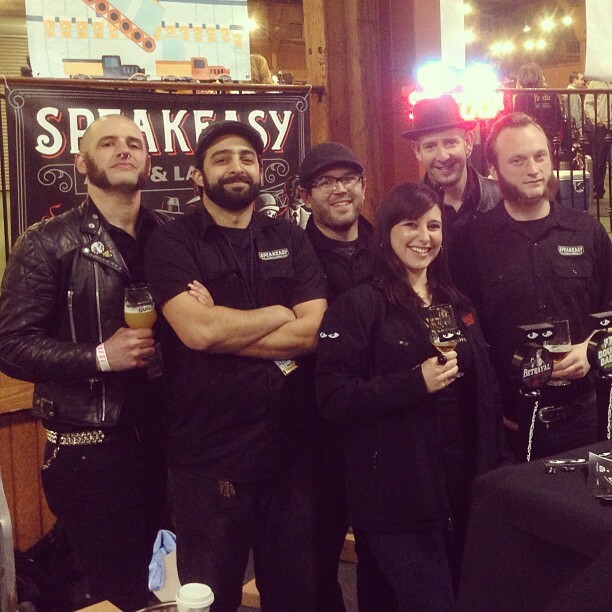 Kushal, second from the left, and the gang from Speakeasy at the opening gala for SF Beer Week in 2013. 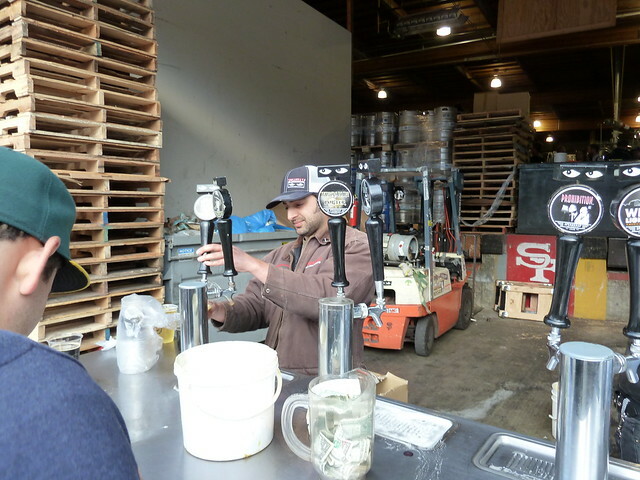 Kush serving his beer at Speakeasy 13th anniversary bash in 2010. Kushal as mad scientist (photo by, I believe, Brian Stechschulte). 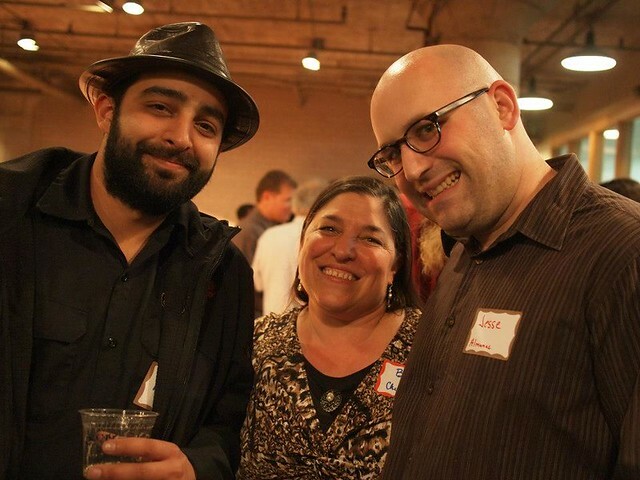 Kushal with Betsey and Jesse Friedman at the Anchor Christmas Party in 2012. 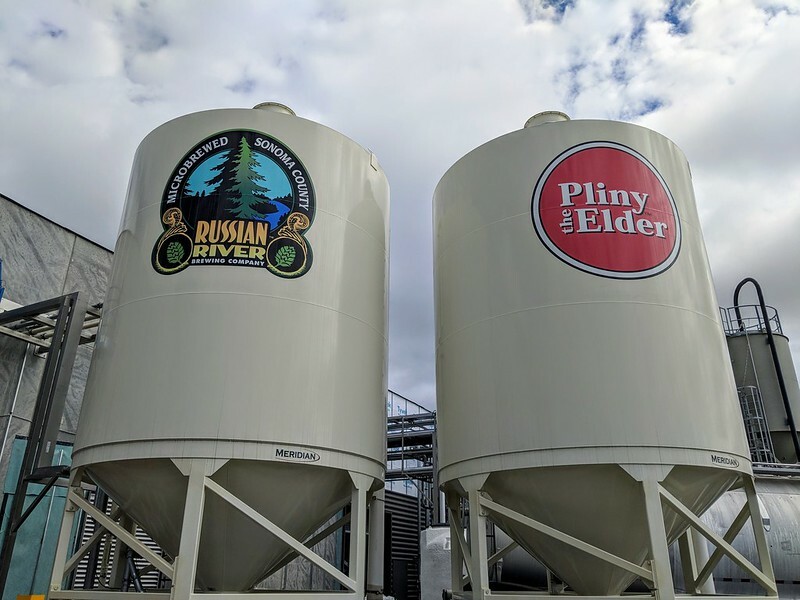 At 11:00 AM today, the grand opening of the new Russian River Brewing Co. production brewery and brewpub in Windsor, California, took place. The 85,000 square foot building houses a 75-bbl state-of-the-art brewhouse, a tank farm, barrel room, coolship, and much more. 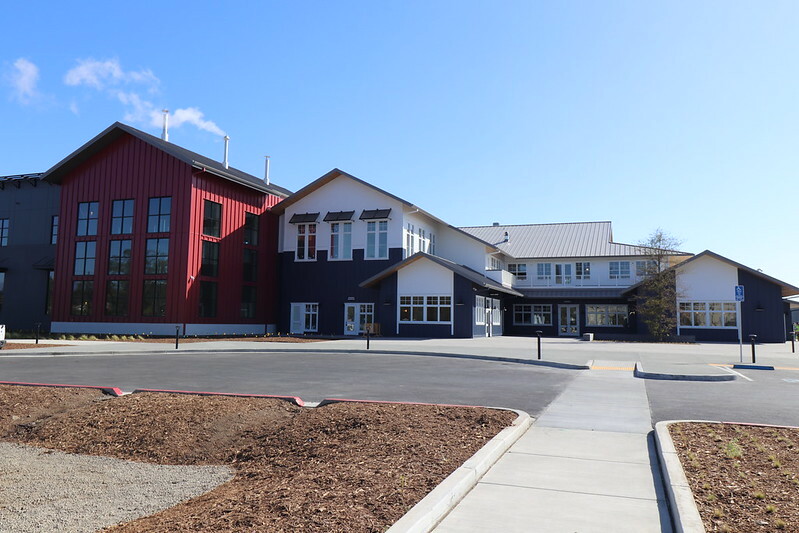 Eventually, they’ll offer both a guided tour and a free self-guided tour that will give visitors a unique view into the brewery’s operations. To see the whole thing, you really need to take both tours. But that part of the experiences is still a few weeks away as they focus on other aspects of the business. I was fortunate enough to have visited the brewery leading up to today’s opening, and here is what you can expect to see when you visit the brewery. 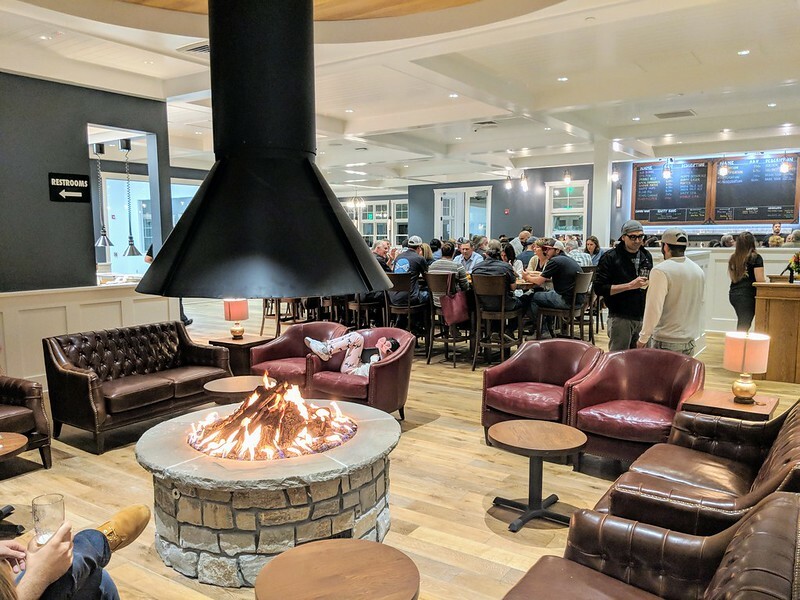 There’s a larger circular fireplace with comfy chairs where you sit with a beer and wait for your table, or just sit and converse with your friends. Of course, you can just sit at the bar, too. Or sit for a meal and one of several dining areas. 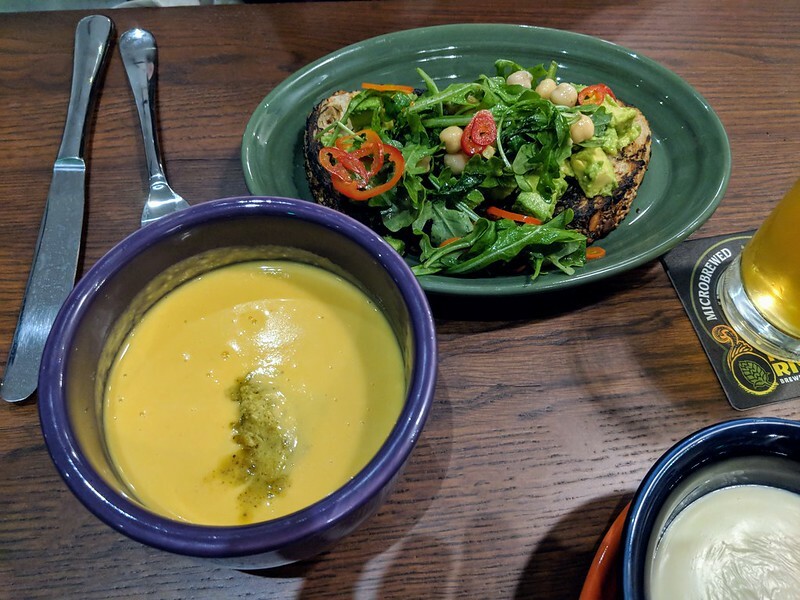 The menu is completely different from the original downtown Santa Rosa brewpub, with no pizza, but they do have a selection of salads and other nibbles. 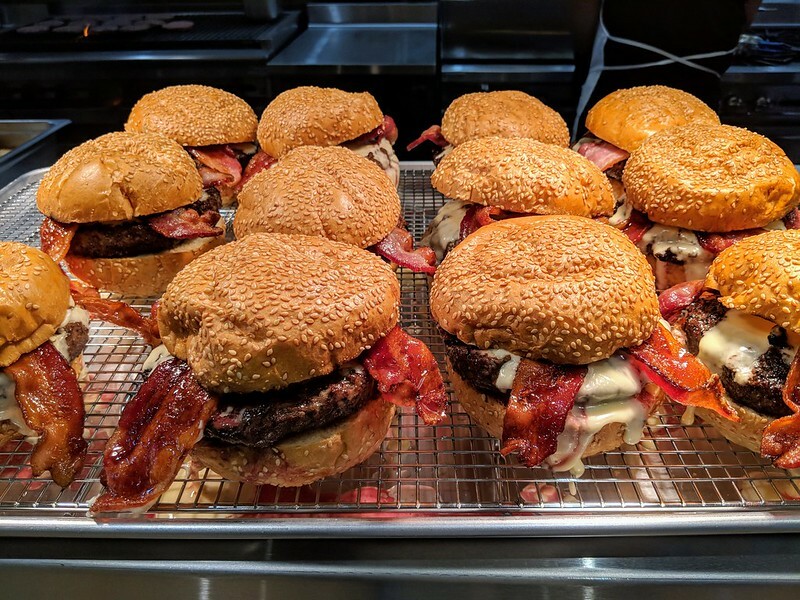 Along with several entrees, like these delicious burgers topped with malted bacon and cheddar fondue. 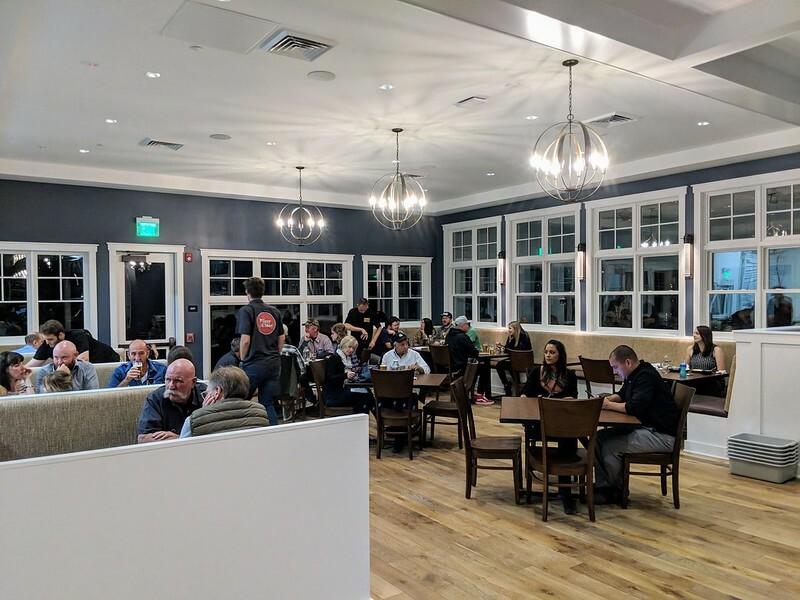 There’s also a second back bar in an adjacent dining area, that in the summer will open up to an open area that overlooks several acres of wetlands. The first beer brewed at the new place was Windsor Porter, a variation on Vinnie’s award-winning Porter (fun fact: Russian River’s very first medal at GABF was for their Porter). 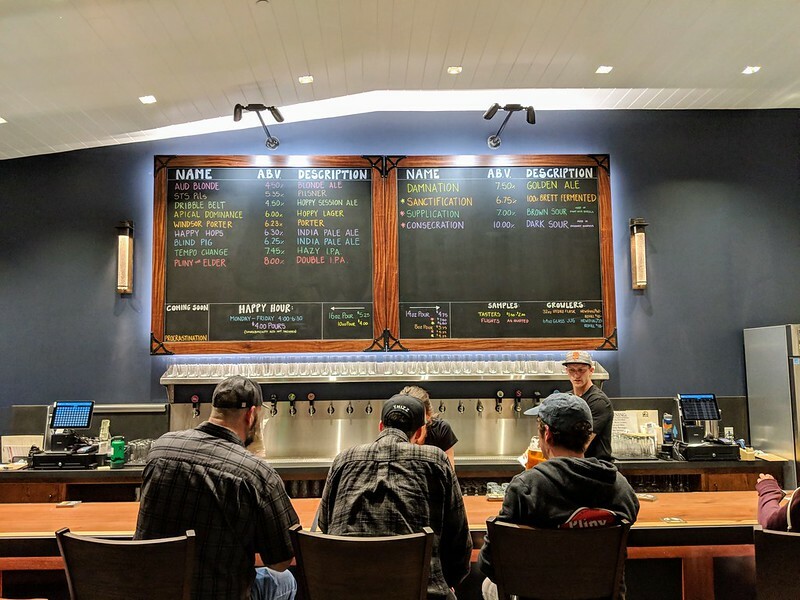 It was also the first beer he brewed at the original brewery at Korbel, and also when the opened the downtown Santa Rosa brewpub in 2004. It’s now pouring in the brewpub (and is quite tasty) along with the first batch of Pliny the Elder, with many more to follow. 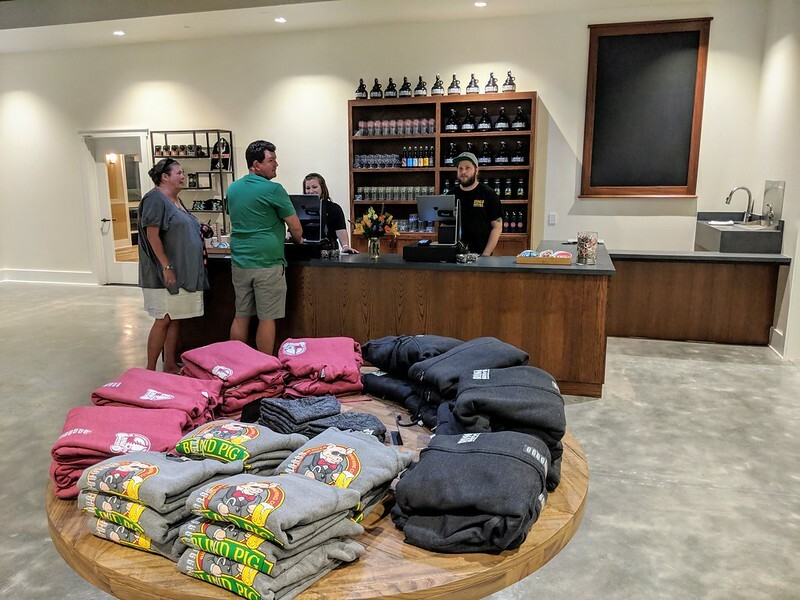 You can also pick up bottles of the Windsor Porter in the gift shop, and they’re labeled “Batch 1.” The gift shop itself is fairly large, and in fact, just the cooler in the adjacent shop is larger than the whole gift shop at the original brewpub. 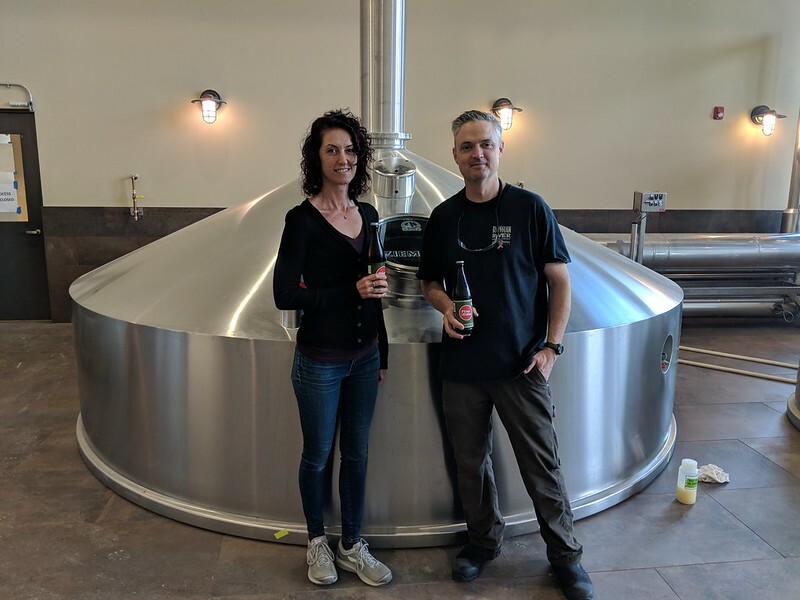 Natalie and Vinnie Cilurzo in the new brewhouse, which is 75-bbls, a little bigger than their previous one, which was 50-bbls. 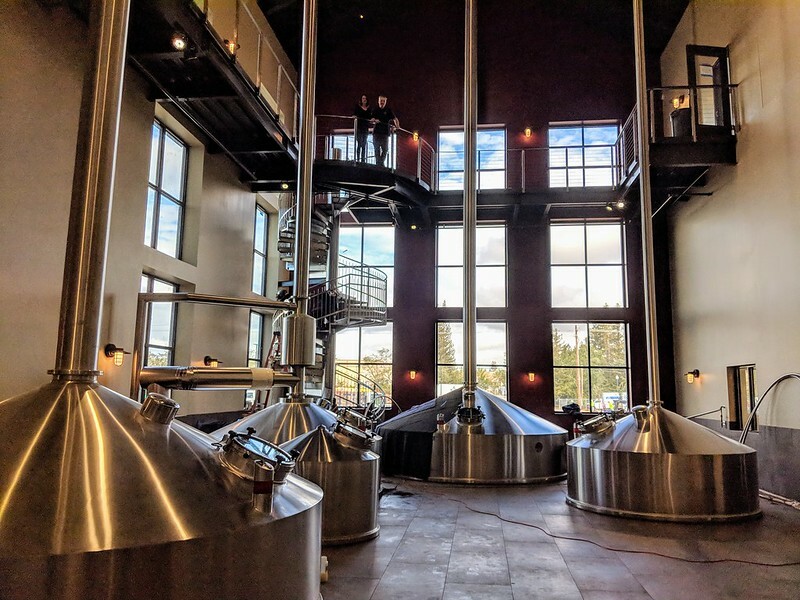 But the new brewhouse is a cathedral of beer, large enough that you can barely make out Natalie and Vinnie Cilurzo, who are looking down from the top of the spiral staircase at the upper center of the photo.